FourFreedomsBlog - Why not look up? It's a bright, beautiful day in New England. The end of a depressing, two-week period of gloom and storm. Looking out my windows, I see nothing but blue sky in every direction. Which could make for an interesting evening. It's going to be warm today, near 50 degrees. Maybe it will be a nice evening, too. How many of you out there are city dwellers? (show of hands). Do you have a pair of binoculars, or maybe an old telescope kicking around in the cellar? Seems to me that every kid had a cheap one at one time or another. This is the time of year when the brightest star in the sky shines at its highest in early evening. Look south after dinnertime, and you�ll see Sirius sparkling whitely even through the worst city skyglow. Sirius is the nearest object beyond our solar system that New Englanders can see with the naked eye, which is one reason it looks so bright. It�s only 8.6 light-years away. Alpha Centauri is only half that far, but we can�t see it from our latitudes. A handful of dim little red-dwarf stars are closer than Sirius, but they require binoculars or a telescope. Sirius has been called the Dog Star since ancient times; it�s the brightest light of the constellation Canis Major, the Big Dog. We�re not sure how the Greeks and Babylonians connected these dots to make a dog, but the stick figure here probably isn�t far off. Drawn this way, the dog is a sort of prancing dachshund with a triangular head. The stars of his head and underbelly are faint, so all you�ll see from Greater Boston are Sirius, the dog�s foreleg (Mirzim), and the triangle lower down forming his hindquarters and tail. These five look more like a meat cleaver (it�s got a small handle and a big blade) than a dog. But get out to the country under a dark, natural sky, and there�s the prancing dachshund, plain as day. For decades, nature lovers and amateur astronomers have bemoaned the widening spread of artificial light pollution washing out the night sky. Most of it comes from poorly designed outdoor fixtures that waste some of their light horizontally and upward. In astronomy as in so much else, the story of modern times is a story of ever better technology in an ever poorer environment. For amateur skywatchers, �better technology�� includes high-quality optical gear that�s much cheaper than it was a generation ago (after inflation). This trend extends to good mass-market binoculars (if you select carefully) that can do a lot to penetrate light pollution. For instance, nearly one binocular field-of-view below Sirius lies a deep-sky wonder that goes by the prosaic name M41. This is a so-called open (loosely packed) star cluster, located some 2,200 light-years in Sirius�s very distant background. It�s about 25 light-years from side to side - wider than the distance from us to Sirius. Center Sirius in your binoculars, then aim downward a little so that Sirius moves to the top edge of the view. M41 will then be in the bottom of the view, depending on your binoculars. You�re looking for a small patch of dim, gray glow with some faint glitters mixed in, floating amid the general starry scene. The achievement lies in finding and seeing it at all. If you succeed, you�re doing real astronomy. 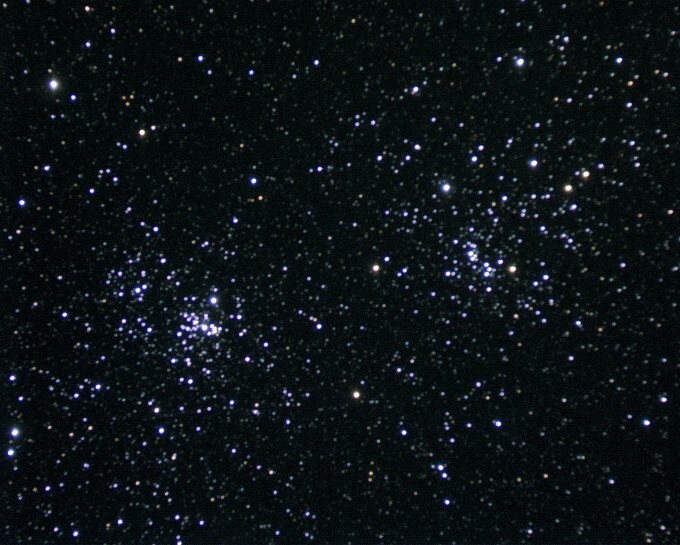 A large amateur telescope resolves the cluster into hundreds of pinpoints and begins to show their colors. Many are pale blue-white, but some of the brightest are yellow-orange. And here we�re on to something. About a century ago, astronomers realized that stars� colors bear certain odd relations to their true brightness. Star clusters played a big role in this discovery, because all the stars in a cluster are at the same distance from us. That means the brightness differences we see among them are real - not just the effect of one star being near and another far. If you plot the brightness of a cluster�s stars versus their colors on a graph, you always get a variation on one basic pattern. Crossing the graph is a long diagonal band, from bright-and-blue to dim-and-red, called the Main Sequence. These are stars in their long midlife period, burning nice and steadily like our sun. There�s a different band composed of red giants, stars that have puffed up in their old age. There�s a Horizontal Branch of stars nearing their final catastrophes. And if you're a totally helpless sky-neophyte...take a look at this chart. (I did reset it to my location; not sure how the bookmark will display it for you.) You can pan and zoom all around the night sky, and maybe get a brief look at all those things you've read and heard about. One of my favorite websites ever is Astronomy Picture of the Day, chock-full of NASA, ESA, and amateur images from a variety of sources. You could lose yourself for a couple of hours in the archives without really trying. But in the vein of yesterday's blog....let's move on to some photos. Here's what we're all up against, in terms of night-sky observation and light pollution. And completely gratuitous, one of my favorite telescope objects (winter..still visible), and another object I hope to see with my own eyes one day. Bonus points available, of course.